06-19 Chrysler 300C, Dodge Challenger, Charger & Magnum SRT8 Stoptech Drilled & Slotted Front Brake Rotors - Stoptech 127.63063L / 127.63063R. Upgrade your braking power and cooling for your 6.1L or 6.4L SRT8 300, Challenger, Charger or Magnum 06-19. Shipping: Normally ships out in 24-48 hours. StopTech® Sport Rotors look great behind custom wheels, improve the initial bite of the brake pads, and help wipe away the debris that forms between the pad and the disc. A set of StopTech® rear replacement Sport Rotors is a great way to match the aesthetics of a StopTech® Big Brake Kit. 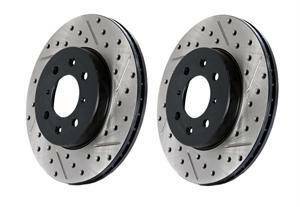 This Drilled & Slotted brake rotor provides world-class braking performance without the earth-shattering price tag. Manufactured using CAD-CAM design on CNC machines, this rotor provides perfect balance and alignment for more consistent and smooth braking power over a variety of driving conditions, including panic stops. The item is also built lighter for less unsprung weight ensuring better driving quality and handling. With G11H18 metallurgy, this rotor features improved durability, while its cross-drilled holes and slots quickly purge hot gases and debris resulting in better heat dissipation and less brake fade under hard use. Compared to a solid-surface rotor, this rotor doesn't allow gases released by the brake pad to create a cushion between the pad and the brake rotor. Thanks to its unique drilled and slotted design, it clears away harmful gasses restoring full pad-to-rotor contact to stop your vehicle the moment you push the brake pedal. With this rotor, you get excellent braking performance right out of the box as its non-directional finish ensures reduced break-in period. Built to OEM specs for fitment and function, the Drilled and Slotted Rotor serves as a direct replacement for factory discs and bolts right in place. This rotor will provide maximum braking performance, reduced warping, and longer service life without breaking the bank. StopTech® has been awarded the highly coveted TÜV approval on several big brake kits. StopTech kits successfully passed TÜV’s demanding series of tests that range from performance and durability, to proper fitment and ease of installation. Although TÜV certification is not required in all countries, TÜV approval demonstrates that StopTech’s Balanced Brake Upgrades meet the rigorous standards set by this respected German Agency. StopTech Big Brake Kits have been awarded a Teilgutachten. The complete kit is certified to run on a particular application, so customers do not need to pay for further testing with the TÜV agency. Shipping Remarks: Normally ships out in 24-48 hours.